← Oh look! A bento! As soon as I mentioned the words nine-course meal, my social networking timeline erupted with reactions that mixed envy, shock and disbelief. How the heck can you manage to eat your way through a nine-course meal, they all wondered. Truthfully, I was wondering that too, as I sat, admittedly a bit bewildered, amidst media people during the press launch of L’Incontro. 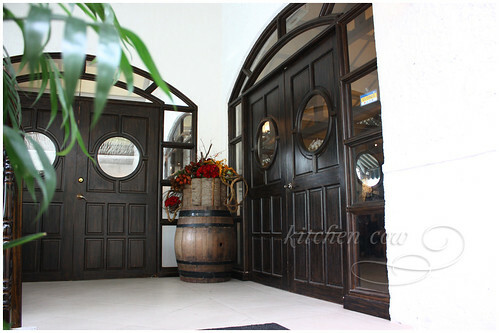 Behind these doors lie copious amounts of food. Someone handed me a Peach Bellini. I took a few sips and prepared to settle down, chatted with some people from Appetite magazine as uniformed waiters passed around trays of appetizers – a dense and creamy gnocchi gorgonzola and crisp asparagus straws with a piquant pomodoro sauce. There is something about crisp fried vegetables that make me happy, this ironic combination of healthy veggies going through one of the more unhealthy of cooking procedures. 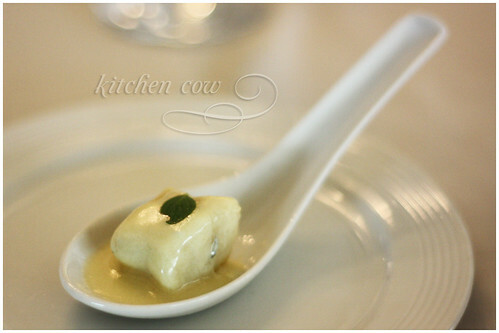 Dolce Gnocchi Gorgonzola – Aren’t amuse bouches cute? 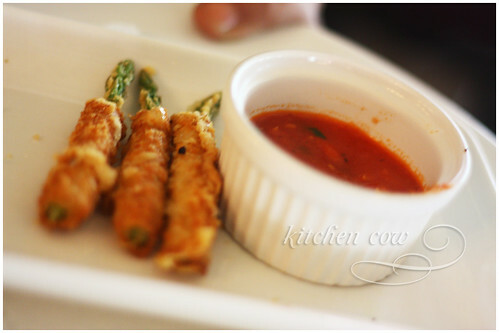 Asparagus Straws with Pomodoro Picante – FRIED VEGGIES! From the corner of my eye, I see a tall, elegant woman approach. 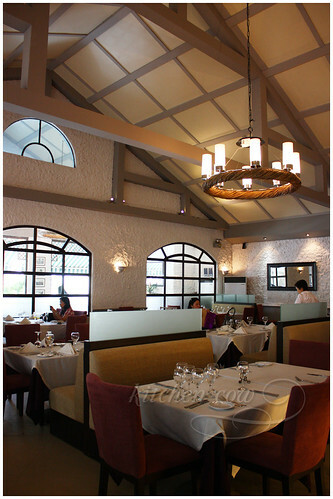 She was introduced as Tina Pamintuan, the new owner of L’Incontro Ristorante Italiano. She’s been handling the reins of the restaurant since March this year, taking over the 10-year old restaurant from its previous Italian owner. She sees the restaurant as a comfortable place for meeting up, emulating a casual Italian dining table rather than a stiff formal restaurant. True enough, with its homey touches and interesting decor, you’d feel welcome in even your most relaxed clothes. As we were waiting for lunch to be served, a magazine shoot was wrapping up at one corner of the restaurant. 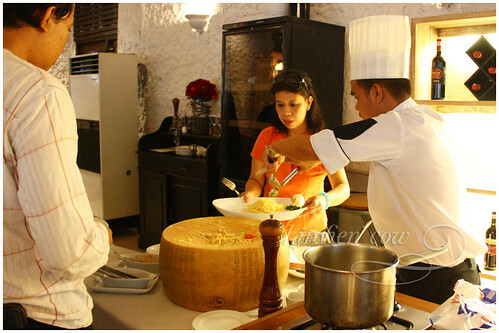 While it wasn’t on the menu, Tina invited us to try the pasta being prepared at the shoot set-up. It was a thing to behold—freshly cooked pasta was being tossed on a gigantic block of aged cheese, before being ladled unto our plates. We were then given the choice to top our pasta with fresh tomatoes, cheese and some basil. Some time later, we were ushered into a small private room with a long table. Bathed in copious amounts of natural light, it felt like we were on the set of some European film where a large family gathers for some important family announcement. In this case though, it’s a simple one—lunch is served! 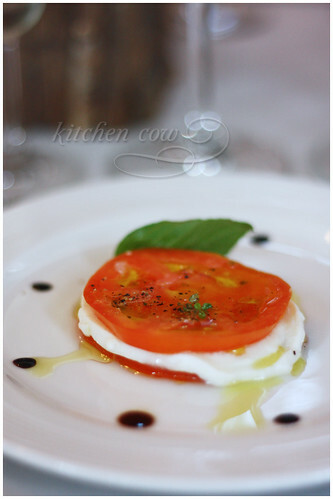 What Italian meal doesn’t start off with a caprese salad? L’Incontro’s salad was set in layers—tomato, cheese, tomato, sprinkled with fresh pepper and herbs then drizzled with olive oil and dotted with a thick balsamic. Lovely paired with a sparkling Italian Prosecco. Following the salad was something they called Crespella with Tartufo Sauce. 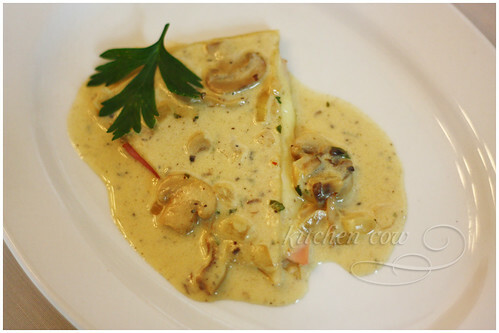 As intimidating as the dish sounds, it was actually a simple ham and cheese crepe, bathed in a mushroomy sauce. While the mushroom tends to overpower the subtle truffle, it still made for an nice, comforting dish. 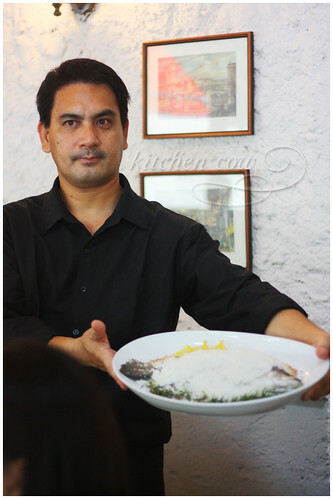 Next to be served was the Seabass Al Sale — a whole seabass baked under a salt crust. Dishes like this are always so enticing to look at. But while the fish course was intriguing, I’ve always been a meat and potatoes girl so it’s understandable if it’s the meat course that really made its mark on me. This entry was posted in giveaways, restos & eateries. Bookmark the permalink. I normally catch up with friends i haven’t seen for a long time and normally after all the hugs and kisses, the HIs and Hellos, I start by saying “so how are you?” and the conversation flows from there. It will be a good mix of catching up with each other’s lives and a little gossip here and there. Of course we make sure we’ll have a lot of food to last us all night. A simple “How are you guys?” should get the ball rolling, so to speak especially among friends. You’re at a dinner with friends you haven’t seen forever. How do you break the ice? I will break the ice by giving them some sweet goodies! since i haven’t seen them for ages, i probably haven’t given them gifts on different occasions for years so on that day (or night) i would like to make them feel that i still treasure them and they are still special to me. I’ll break the ice by talking about food. I’ll probably start by talking about the restaurant we are in then the conversation will definitely go a long way. One night will probably be not enough and we’ll plan for more get togethers in the future. That will surely set the ball rolling.. I would start it with a toast … along with good wine and funny anecdotes of our past experiences as a group Am sure everyone will join in the fun! Talking about different tourist destinations in the philippines will be a great icebreaker. I could recommend some of the places i have been to and ask for their recommendations and feedbacks. one round of drinks (hard or coctails for ladies) will be a great icebreaker. I’d probably start with a compliment to each of them–a nice bag or dress or shoes or their haircut and complexion. Followed by “Big time ka na ah, remember when…” Acknowledging the changes in them and following up with a bit of nostalgia works every time! a shared experience from years past usually breaks the ice. and then a round of drinks after! alcohol is the ultimate social lubricant. paired with good food of course! After a long time of not seeing each other, I would probably break the ice and say.. Friendship is about picking up where you left off. Seeing each other again for the first time in a long time is a perfect opportunity to update each other on what has been happening to you. It’s about enjoying each other’s company again and remembering how comforting it really feels when you are with the company of your friends. I will definitely start with an INSIDE JOKE. It will remind my friends of our good old times. more importantly, it will remind them that they can share anything and everything they want to share throughout the dinner. food, laughter and friendship… my favorite combo! I think I would personally open with an awkward “How are you?” which would lead to a more open discussion – which is the way my own friends are like. Or possibly something like a laugh and bringing up a random moment from our past. A simple “how are things going with you?” question should suffice, and the ball should start rolling from there. For me, it prolly depends on the person I’m with. If I’m with friends, I’ll probably say a joke. If I’m not, just a casual, “How are you?” (and then fish for something relevant from his/her answer, then proceed from there). Just smile politely, and don’t keep your lunch/dinner date feeling awkward and everything would be just fine (I hope so).